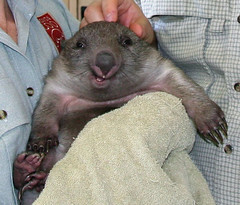 We think one of the cutest Australian animals is the wombat. So it was tremendously exciting when Jeanine told us that we could go into work with her at the zoo and meet a baby wombat! Wombats are slow-moving, muscular marsupials. They are herbivores, spending many hours each night grazing on native grasses and roots. They live in burrows, digging extensive systems of tunnels with their powerful claws. Sadly, expanding human settlement is steadily encroaching on their habitat, making accidents with cars more and more common. 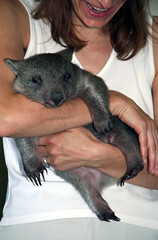 Jody is a seven month old baby wombat who was orphaned in one such accident. She is being raised by a colleague of Jeanine's at the zoo, in close contact with humans. When she is older she might participate in programs with kids. 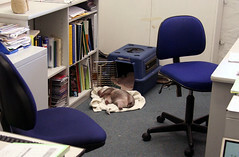 Wombats are usually laid back and slow creatures, and Jody spends most of her time napping in the office. When they are comfortable and relaxed, they like to sleep belly up! Jody seemed to enjoy being cuddled, although it was hard to tell who was happier, the cuddler or the cuddlee. Even when she was on the ground, we found that she would happily roll over for attention, exposing her soft belly to be stroked. Here she is, being cuddled by Meghan, Shami, Jeanine, and Sean. Just look at her grin! Ok, that was really cute. 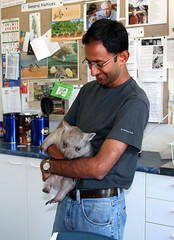 But I don't know which was cuter, the baby wombat, Dibbie or Shami's narrative. Keep the blog going, it is so great to read. hi. 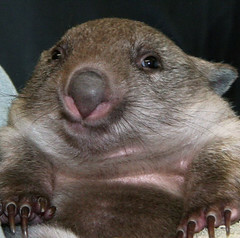 just wanted to thank you for posting the cute wombat. 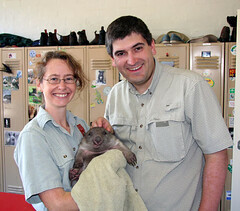 my fiance actually calls me a wombat, and having never seen one before i can honestly say i am not insulted! how cute!!! i gotta tell yah. tis is the utest thing i've seen in a very long itme. i respect you a lot for posting this pictures. i hope o come to your site more often. i had a hard day and this made it a lot better. I love'em wombats!!! Thanks for posting these pics! 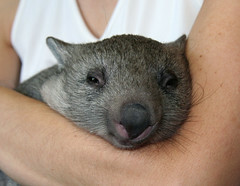 Does a baby wombat have a special name or is it just called a wombat? What is a baby wombat called? 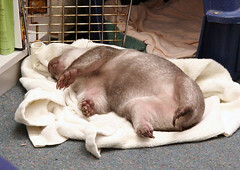 I'm not sure what a baby wombat is called, but some sites (like this one) suggest "joey", like a baby kangaroo. Wombats are great. 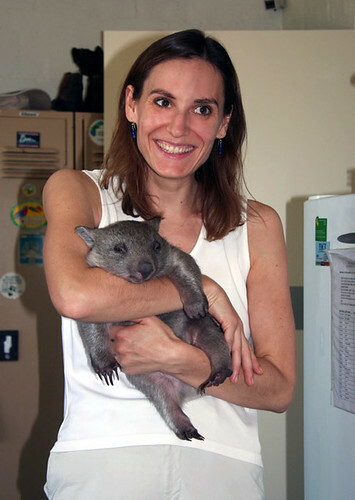 I wish I can addopt one :)But I know, Wombats are no Pets.. but i would love them 4ever. :) They so cute. One Question: Are Wombats in the free Nature dangerus ?? Can they bite ore attack you when you meet some ?